Today we have an image of Dionaea muscipula, by Anne Elliott (aka annkelliott@Flickr), who also provided the photo of the Oxalis for the series. A photograph of this species showing its completed nastic movement is available via the Botany Photo of the Day Flickr Pool: see Rob Co’s photograph of Dionaea muscipula. Thank you Anne and Rob for sharing your great shots! 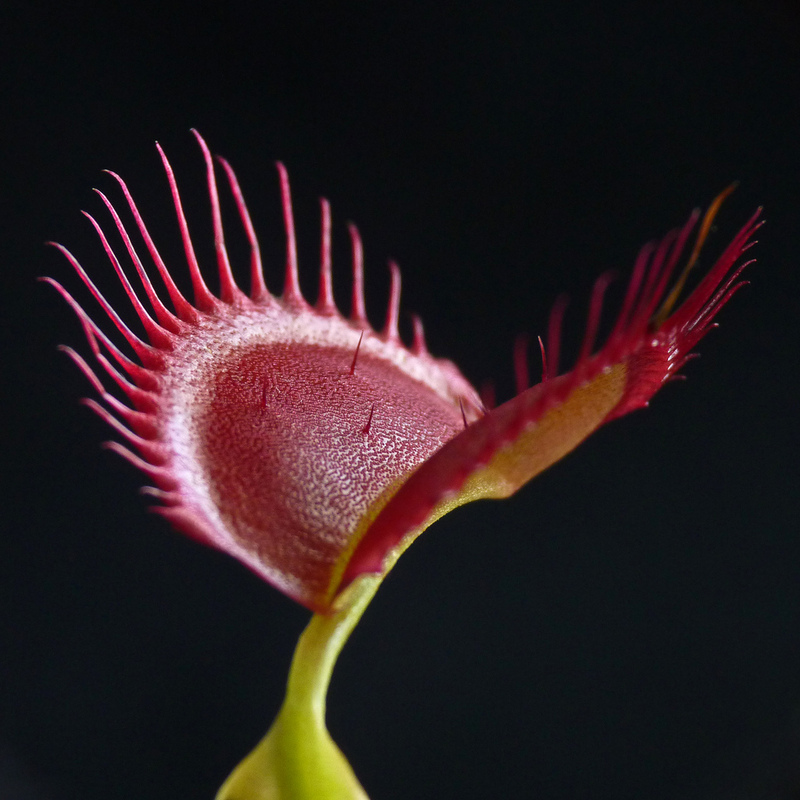 To finish off the series on nastic movements, I couldn’t resist including Dionaea muscipula or the Venus flytrap. This species exhibits seismonasty or thigmonasty, which is the nastic movement due to a touch stimulus (see a video: Venus flytrap capturing prey). This type of nastic movement was also highlighted in the first entry of the series on Mimosa pudica. Dionaea muscipula is native to North Carolina and South Carolina in the USA. Populations of plants recorded in New Jersey and Florida are often considered to be exotic introductions. Due to its special qualities, Venus flytrap is also a popular houseplant. As noted above, Venus flytrap is a carnivorous species that traps and digests insects for a source of nitrogen. The modified leaves of this species consist of an upper and lower portion. The lower portion, a flat stalk, terminates with the two-lobed upper portion (with the lobes joined by the midrib). Each lobe is lined with comb-like bristles. The red-coloured centre of the trap contains three sensitive trigger hairs (seen clearly in Anne’s image). When stimulated by touch, the trap shuts by means of electrochemical signals. The trap may take several minutes to close fully. Once closed, it will remain so for 5-7 days in order for the plant to secrete enzymes and digest the insect (see: Volkov, AG et al. 2008. Kinetics and Mechanisms of Dionaea muscipula Trap Closing. Plant Physiology. 146(2):694-702). Stunning photograph! Thank you Anne, Taisha and Daniel! Beautiful Photo! Every time I see this plant I am amazed at what has been accomplished by the evolutionary forces at work and this photo shows off this beauty especially well. in humans – Dr. Keller is the most known for using Venus’ Flytrap as medicine. I’m so sorry the series is ending! I may have missed a few and not yet gone back through the calendar, but you’ve gotten me thinking of a few closer to my backyard plant “movements,” though perhaps that’s not quite the right word for peanuts and blackberries sending shoots into the ground to fruit or root — and possibly travel a bit away from soil pests or diseases which may have attached themselves to the parent plants. Gorgeous photo of a great plant. I delighted in seeing these little guys in the New Jersey Pine Barrens on a botany field trip when I was in college. I didn’t realized that the New Jersey populations were considered “exotic introductions”. They were a highlight of the trip.